Maybe in a few more months we can be doing this with a virtual puppy? Great pic. 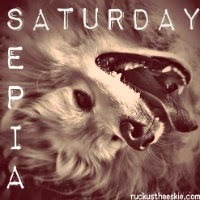 Happy Sepia Saturday! That sure sounds fun Ruckus! It is amazing what they are doing now!! Enjoy your little tug, have a great weekend. In our SS post today, Ethel and I were sharing a long game of tug, too! FUN FUN FUN! My Humans aren't into the tech arena, other than what they need for business. Don’t forget my new home is http://www.browndogcbr.net. I’m still workin’ on it. I’ll be tryin’ a different format Monday. This will be my third one since my move. Thank you if you have been giving me feedback. If not, I would like to know how it works for you personally. If you’ve already given me feedback, I still want to know the pros and cons for you when I show y’all a new look. Oh man, tug is just the greatest! Sepia Saturday #79: Unidentified Flying Object! Sepia Saturday #77: A Little too Hot Now, Buddy.